As part of my never ending love for all things creepy, I'm continuing the Halloween love shout outs to those that share in the spooky spirit! Starting off with this genius idea, transforming trash into terrifying treasure. 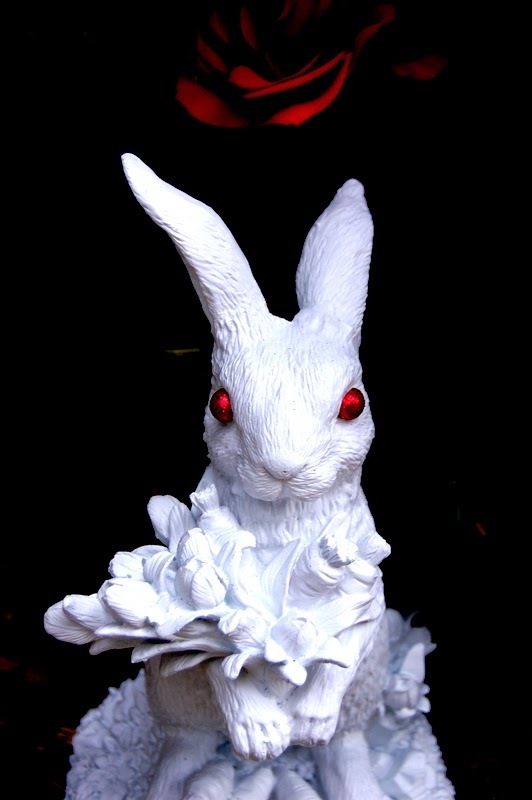 The trick is simple - after painting an animal statuette white, paint the eyes red for instant sinister effect. Check out Northstory for the inspiring before and after. Anyone have a collection of animal statues they want to part with? Want more Halloween inspiration? Check out some of my favorite Halloween Love features from years past or browse my own Halloween parties in the entertaining gallery. One could also add some fangs fairly easily...perhaps tipped in "blood"? You are pure creep factor! and I love ya. Thanks for the share Stefanie! I made him as part of some gothic themed Alice in Wonderland front porch decorations that I did for my kids last Halloween. They loved him!